I think I have yet to meet a Linux distro that didn’t include cron, in some fashion or another, by default. I suppose in that sense it doesn’t bear my explanation. I’ve used it only rarely by design; other times, it was just running by default. 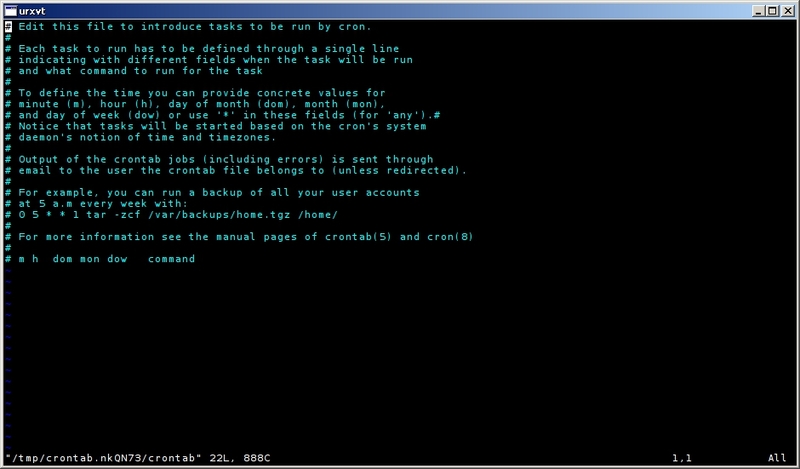 crontab is an underling to the daemon. If you want to get started with cron, the comments in the basic crontab -e display will give you hints. If you need more of a jump start, you could look over this quick how-to that some geek wrote, years ago. This entry was posted in Linux and tagged job, schedule, system, time on 2013/10/01 by K.Mandla.